Also known as Beet, Garden Beet, Table Beet, Red Beet. Golden Beet or Roman Beet. Beetroot is the round, dark red root of Beta vulgaris, eaten cooked as a vegetable, especially cold in salads. It’s often preserved in vinegar. Beet roots come in a wide range of colours and sizes, such as Red, White, Golden or Yellow and Chioggia (striped). Beetroot is cultivated variety of the wild Beta vulgaris known as Sea Beet. Other cultivated varieties of Sea Beet include: Sugar beet, Spinach Beet, Swiss Chard and Fodder Beet. It is a root vegetable with two edible parts, the red globular root and the young green leaves, usually called, beet greens. The beet greens have green or red veins and are used as a vegetable. The roots are mostly globe shaped with a deep red flesh, but some beets may be shaped like thick carrots and some varieties have golden or white flesh. The size of a beet ranges from the size of a small mandarin to the size of a large grapefruit. The smaller sized ones are tastier and softer in texture. The red globular beet is the most important worldwide. Europe and North America produce the bulk of the crop. Their combined annual commercial production amounts to 900,000 t (excluding Eastern Europe). The golden or yellow beet is grown on a very small scale for home consumption.It’s pale orange in colour and reaches up to 4-inches in diameter. The flesh is golden yellow and very sweet. It does not bleed like red beet when cooked. Its roots and leaves are edible. Beets have the highest sugar content of any vegetable but they are also very low in calories and have zero cholesterol. 100g (3.5oz) of beet provides 43 calories.The characteristic sweet flavour of beets is experienced in raw, cooked or canned beets. Fresh beets are higher in vitamin C and folacin, than cooked, and have a distinctive flavour and crisp texture. The young leaves are an excellent source of beta carotene, calcium and iron. Beets contain geosmin which causes its typical earthy smell. 95% of the beet produced in the USA is processed for canning and sold, plain, pickled or spiced. (The Wellness Encyclopedia of Food and Nutrition). Beets are usually boiled, steamed, roasted or eaten raw, either alone, as a side or combined with any salad or vegetable. Prolonged cooking of beets makes the colour fade. They can be used as a ingredient in rice and curries or pickled or made into relish. Beet juice is a popular heath drink. Beet can also be used in smoothies. Beet greens: can be prepared the same way other greens like spinach are prepared. It has a taste and texture similar to spinach. The scarlet colour of beet is due to a combination of purple pigments, betacyanins and yellow ones, betaxanthins. The chemical responsible for the red colour of beets called betanin or beetroot red, is used industrially as a natural food colour to improve the colour of tomato paste, sauces, desserts, jams, jellies, ice cream, sweets and breakfast cereals. Betanin is water soluble and sensitive to high temperatures, oxygen and light. Early crop beets: are sold in bunches with leaves attached or as clip-topped beets in perforated plastic bags. Beets are available all year round, but in winter you can find baby beets which ate to sweeter and tender than mature ones. It’s always advisable to buy small or medium sized beets. They are more tender than the larger ones. The beets should be heavy for their size, firm, without any cuts or blemishes. 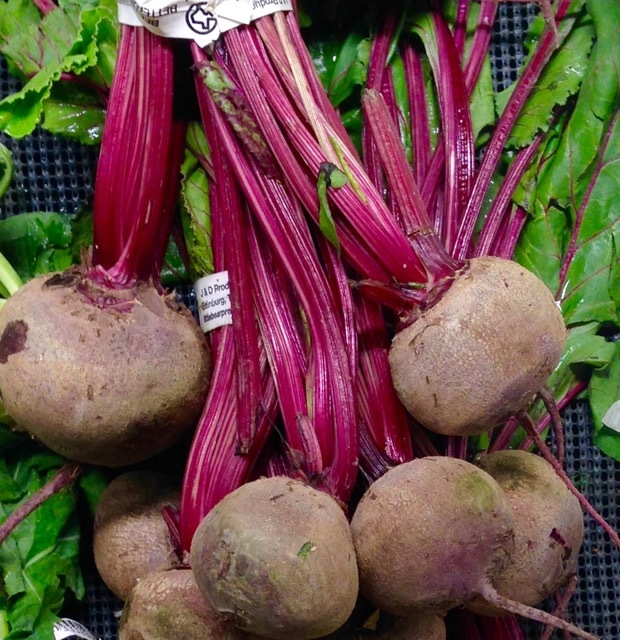 It’s better to buy beets with the stems and greens still attached. The leaves should be brightly coloured and fresh looking. Avoid limp and yellow leaves. Younger leaves are better the mature ones. Cut off all but 2 inches of the green stems. Save the leaves because they are very nutritious and can be steamed, sautéed or shredded in salads! Forms of strikingly coloured large leaved beets are used as ornamentals. We just love beets – and they are great slow cooked or quick cooked. The greens are very tasty, but should be eaten as soon as they come home from the store, as they do not keep well.